Trudeau is a family-run corporation that has been in business for over 100 years. In 1945, small kitchen appliances came on the scene. Soon enough, the company developed more sophisticated products. Fondue sets come in different types. Traditional burner styles are generally made of stainless steel or enameled cast iron. They are fuelled by gel or denatured alcohol, have a stand and a pot which sits over the burner. These traditional fondues are good for keeping cheese or chocolate warm. However, they may not reach the required temperature for oils to cook meat. Electric fondue sets are another option. Again, many are suitable for cheese and chocolate, but may not be powerful enough for heating oil. The Trudeau Alto 3-in-1 Electric Fondue Set offers the best of both worlds. It is perfect for heating and melting foods, but also offers enough power to cook oils and broths. Let’s look at some of its features. The fondue set measures 10.5" by 11" by 9.5" and weighs 4 pounds. It has a generous 5-pound capacity, making it ideal for larger gatherings. The stainless-steel pot can be used for preparing oil or broth fondues, and looks great. The stoneware insert can be placed inside to create a water bath, or what is known as a ‘double boiler’. Below the stoneware insert that houses your ingredients, the water is heated in the pot, thus warming the items above. This is for keeping cheese and chocolate at the correct temperature. There is a stainless-steel guard that fits over the pot, to prevent splashes. Additionally, it holds the fondue forks. The base has a powerful 1500-watt heating element and the temperature is controlled by a thermostat. An LED light tells you when the unit is on and also when your specified temperature has been reached. The heat can be set via a dial-style temperature wheel, varying from low to high. The power cord is about two feet long and has an easy-release feature for safety purposes. The appliance comes supplied with six color-coded fondue forks, which are suitable for pieces of bread and meats. There is also an instruction manual and recipe book. The fondue set has a five-year warranty. One of the advantages to this fondue set is the double-boiler feature. This basically gives you the option to have two fondue pots in one. For example, say you serve cheese for your starter. Remove the stoneware insert, empty the water from the pot and then use it to heat oil for the main course. You could even wash the stoneware insert and have a chocolate-fondue dessert prepared in just a matter of minutes. We love the adaptability of this set and also appreciate the larger-than-average capacity. Especially for chocolate or cheese, the water bath keeps the food hot for ages - though you'll have to keep stirring! The even temperature provided using the double boiler prevents food from sticking or burning - you could use it on a buffet or as an addition to a BBQ. This also makes it easy and quick to clean. There are a couple of niggles associated with this product, though. The length of the cable means I sometimes need to use an extension lead, depending where it’s being used. Some foods also need cooking on a conventional stove-top first before transferring to the fondue. 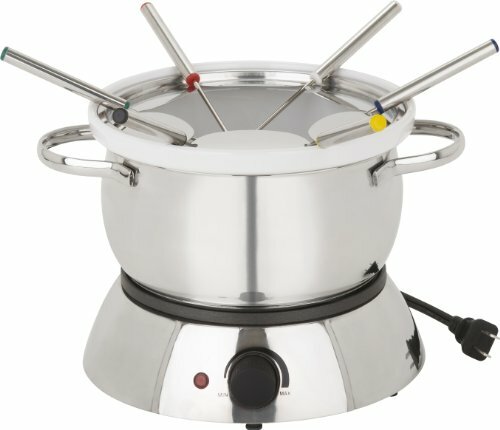 Of the many fondue sets available on the market, the Trudeau Alto 3-in-1 electric fondue set is one of the only options that features a double boiler. This means it can cater to a wide variety of fondue needs and, due to its size, is able to serve large groups at the same time. We are always looking for new and innovative ways to cook, but sometimes the old traditions stand firm. Tried and tested, fondue remains a favorite from Switzerland where it was created to Sweetwater, Texas. It’s quick and easy to prepare a tasty meal for one or more. You might find you have leftover bread which is just past its best. If so, use it up with a cheese fondue. Chocolate is always received well, but melt it an add seasonal fruits and you will be good to go. Suitable no matter what time of year, fondue is a leisurely way to entertain, and there is minimal clean-up afterward. What's the Best Oil for Meat Fondue? What's the Best Wine for Cheese Fondue? What Are the Best Meats for Fondue?